Our kids are handled multiple times a day. With bottle feeding - it's easy to learn individual personalities. We pride ourselves on raising kids with good temperaments and winning personalities. 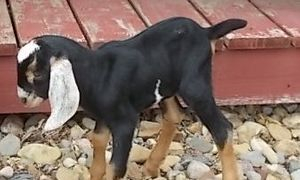 We want you to be satisfied with your new kid, so it's important for us to match your herd goals and needs with the right baby goat. All kids are eligible for ADGA registration and papers are available, either when you pick up your kid or they'll be mailed to you, depending on the timing. Between milkings and feedings, I'm trying to take photos and get information uploaded. If you have questiions about a particular kid, please contact me. 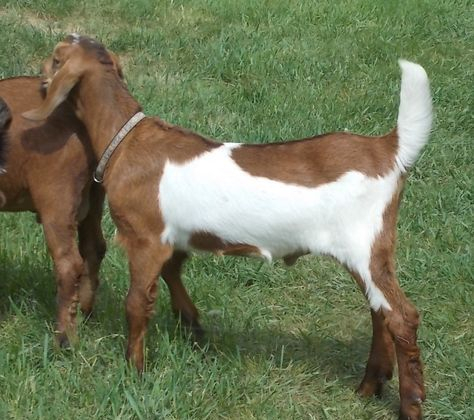 TWIN BUCKLINGS - "Chip" & "Drifter"
My strongest milker Cherry started off our kidding season a day early. She delivered these nice, strong, healthy bucklings and immediately began to produce her normal large volume of milk - over 12 pounds (6 quarts!) a day on test. These sons of Atlas resemble their sire in size and strength. This handsome boy came out with poise and substance. He's long, straight and has great boning. We love those long ears and Roman profile. He looks very much like a mini-Atlas. Chip is more refined than his brother and a less intense. Atlas passes seems to pass his excellent heads with long ears, strong bodies and great legs and feet to his kids. Chip on May 23, 2016 - almost two months old. This handsome boy came out with poise, substance and a lot of white. The longer he's around, the better I like him. He's long, straight and has great boning. We love those long ears and Roman profile. Best of all, he's friendly and amiable, though there's no doubt he's all buck! I'm sure as he matures, he will taek his responsibilities as seriously as Papa Atlas. The longer he's around, the more there is to admire. He's got it all - brains, looks, style and great genetics ready to pass on his milking heritage. This photo was taken at just one day of age. Drifter - taken in early May, 2016. This was taken just before starting her first milk test of the season. She's carrying over three quarts of milk. Photo courtesy of my tester - Annette Tait. Cherry on the milk stand April 4, 2016 - just ten days after freshening. Cherry's udder February 4, 2016 - just two days before drying up. This lady loves to make milk! Rupee is a young doe that’s an absolute delight to hand milk – just like her mother and the grandmothers on both sides. She has nice-sized teats and a "soft as a glove udder." Rupee is an easy keeper and both sides of her pedigree have does with long, level lactations. Atlas comes from strong milking lines and gives that strong, long stature and fabulous type. He provides boning and lovely, sharp withers. Sadly, these three kids were large enough and entangled in such a manner that the two black and white doelings didn't survive. Traveler is a sweet, quiet buckling. He's very, very straight and smooth with an oh, so mellow personality. He would be wonderful for anyone looking for a gentle buck, likely to be a bit on the smaller side. Traveler is pretty quiet. I would expect him to produce doelings ready for hand milking. Mony is herd queen and turned ten years old in January. Though she's not in her prime, she produces daughters that easily milk over a gallon a day at peak and are willing to milk over a year. Her friendly attitude welcomes visitors to the farm. Paco is a strong, solid buck with a sweet nature and quiet manner. He is very, very quiet. Paco scored an 89 at Linear Appraisal last fall. Mony has a permanent score of 88, so their son has an incredible goal to live up to. It's been many years since Mony had a son for sale. This breeding combines strong genetics from the West Coast. HARNER TEN DOLLAR BILL aka "TEN"
This photo was taken 18 hours after birth. Doesn't he just scream "buck?" From powerful shoulders and strong neck and front end to straight, correct legs - this guy is ready for business - albeit very quietly. Born to a 10-year-old doe and weighing 10.5 pounds at birth - he's definitely a TEN! Though he's only two days old now, he acts like a gentleman. I expect him to be like Paco - quiet and gentle to handle, but a smooth talker to the ladies. 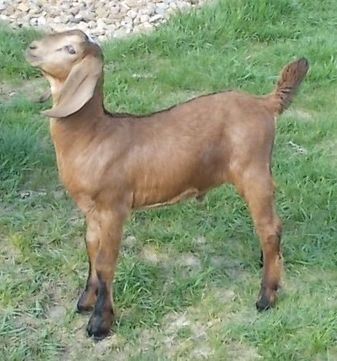 First freshener Dimples is a Paco daughter bred to Atlas, so these kids combine the genetics of our bucks. It was an incredbily difficult birth for a doe just one year and two weeks old. The bucklings weighed 6.6 pounds each and the doeling weighed 6.2 pounds, so they were very even and all tangled up. Thankfully they came out unharmed and Dimples is starting to recover. She has been able to produce enough colostrum for three out of four feedings, so that's a great sign she'll follow in the footsteps of other Mony daughters. Because Dimples is a first freshener and unproven, we will be banding her sons and selling them as wethers. Her daughter will also be sold and we have a waiting list. 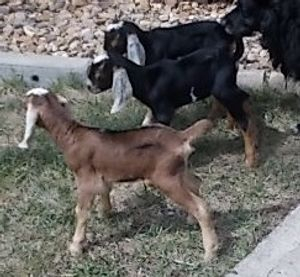 They are pictured below at less than 12 hours old. 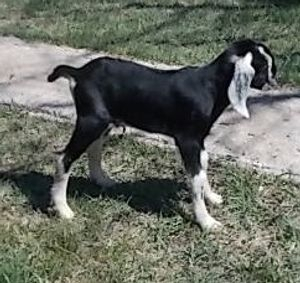 The bucklings are black with frosted ears, top knots and small side spots. They also have brown legs. One has white on three feet. 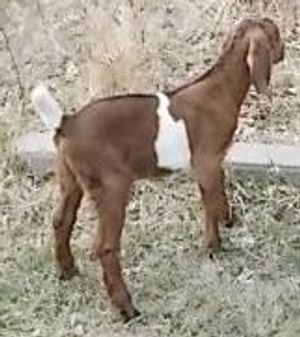 The doeling is brown with white top knot, ears, and muzzle. Dimples's doeling.- just a few hours old and ready for her bottle! 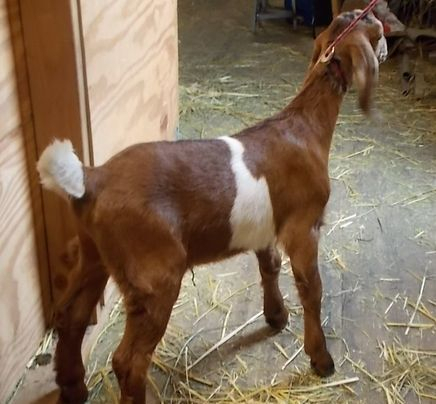 Another look at this pretty doeling headed to South Dakota. 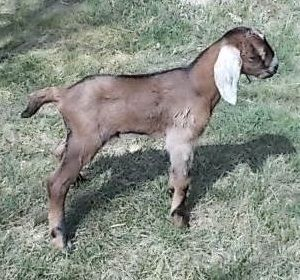 A Dimples son..he will be banded and available as a wether. Dimples's bucklings...note the white toes on the one closest to the camera. These two brothers will both be banded and sold as wethers. This is Star's surviving buckling. A brother and sister completed her litter, but sadly, didn't survive. I'm working on better photos. 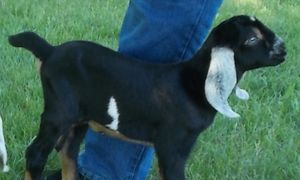 He has been banded and sold as a wether. He'll be big with long white socks and very striking, but he's not the best I have. This photo was taken at less than 24 hours of age. What a chunk! This young man arrived a couple of days early (April 21st) to first freshener Shekel along with his sister. While he's gorgeous, I don't believe in sending out bucklings from unproven does. He's been banded and sold as a wether. Meet Harner Prairie Coinflower aka Flower. 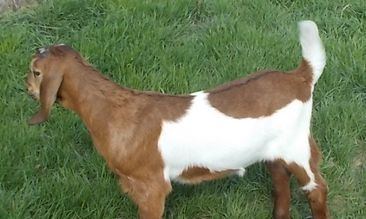 Born twin to the buckling above, Flower may be the finest doeling ever produced here. She's got an extermely wide head and stance, long ears and strong boning. I'll upload more photos later. She's now in South Dakota along with Desti as a start of a new registered herd. TRIPLETS! 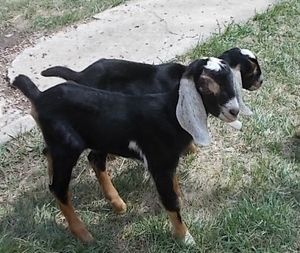 Our last kids arrived June 7th - two bucklings and a doeling. Here's the two bucklings just two days after birth. Leonard is in the background and Sheldon is demanding attention in the foreground. As nice as they are, Millie is a first freshener, so these two will be disbudded, wethered and offered for sale. Saving the best for last - here's Millie's beautiful doeling - the last of our 2016 kids to be born. She's got an extraordinarily wide head and front end and is simple delightful. We intend to retain her for our herd.